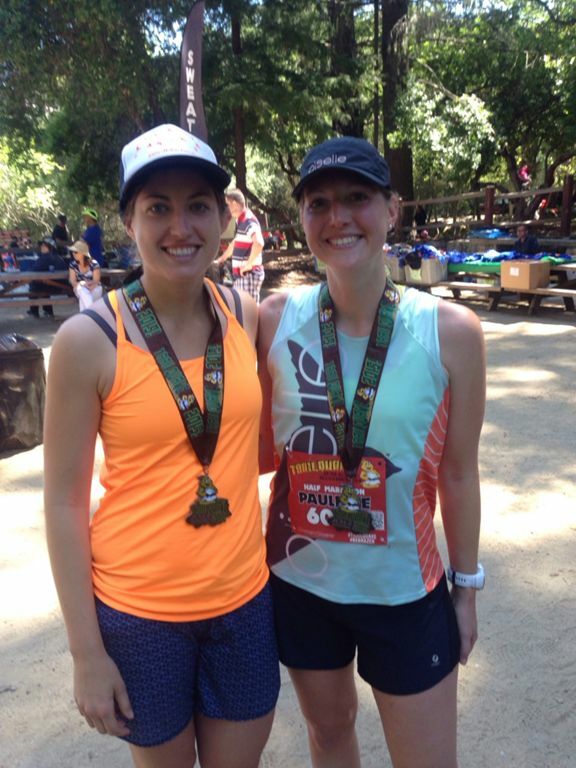 The Trailquake half was on June 6, and it's a race I've had my eye on since moving to the Bay Area. 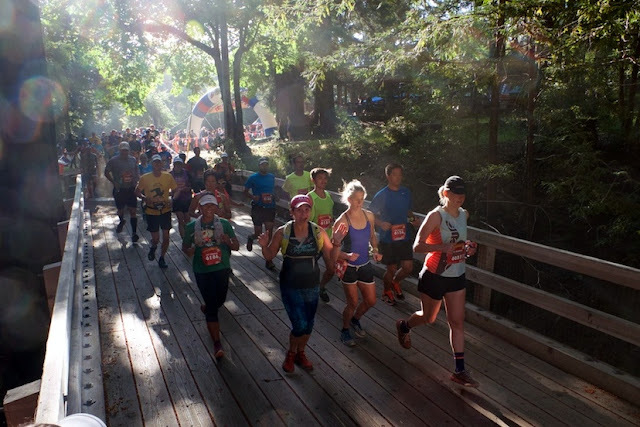 The race is held at Sanborn County Park, only about a 20 minute drive from our house, so it was very easy to get there in the morning. It's run by a Bay Area race company called Brazen Racing and they always do a fantastic job. 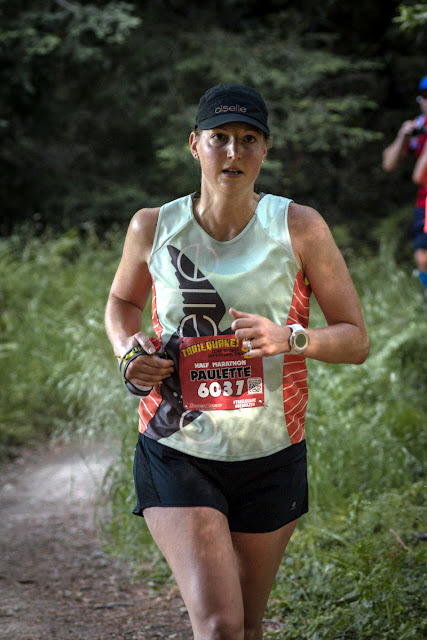 I knew before signing up that this race would involve 3000 feet of climbing and that it's known for being a very hard half; that's part of why I wanted to do it! Ok, that and because the name is Trailquake, it runs on the San Andreas trail, and I have a weird fear/obsession with earthquakes. The course didn't disappoint. As soon as we crossed the start line we began the uphill climb that lasted about 3 miles and was notably steep. The elevation profile looks like it flattens out on top, but don't let it fool you - there are ups and downs the entire way to keep you on on top of your game. Elevation profile from the Brazen Racing site. One of the best aspects of this race is the park itself. 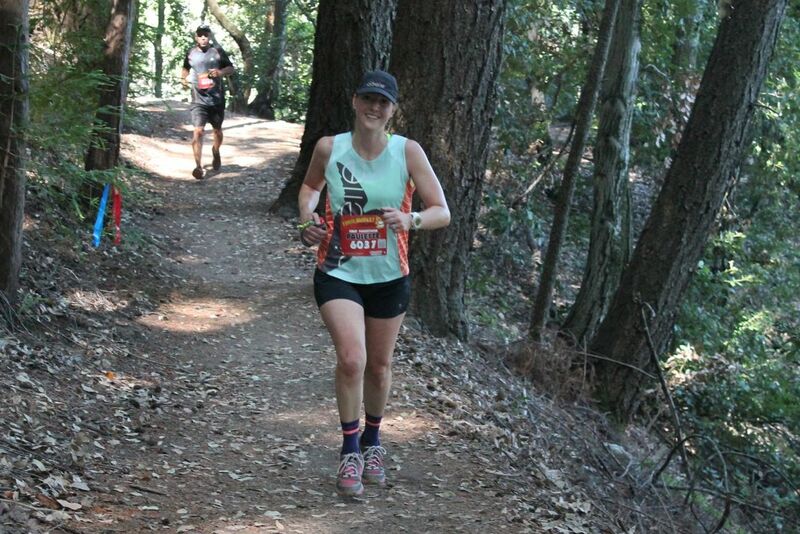 The trails are almost all covered by Redwoods and other tall trees, making it picturesque and keeping the sun from frying you during the run. Most of the trail was single track too. This is definitely a park I need to run in more often. The course makes a T shape so you get to pass people on out-and-back sections; it's perfect for cheering on friends! There were a few Go Far group runners, plus Sophia and Kevin, to cheer for along the way. Sophia's fiancé, Charlie, ran the 5K (and won!) but I didn't get to see him on the course. There were also a ton of aid stations for a trail race, every 3 miles or so. Knowing the total climb involved in this one, my target time was to be under 3 hours and I met that goal without any trouble. I finished in 2:56:12 and I'm pleased with my splits in general. I'll keep working on faster climbing and faster downhills, however I felt strong the whole time and that's what is most important to me right now. After we finished, we enjoyed the many food items provided (including things like pie, brownies, goldfish crackers, M&Ms, potato chips...I could go on and on) and hung out with Sophia, Charlie, and our Go Far friend Andrew. We enjoyed chatting and relaxing at the picnic tables in the park for quite a while. All in all, I loved this race. 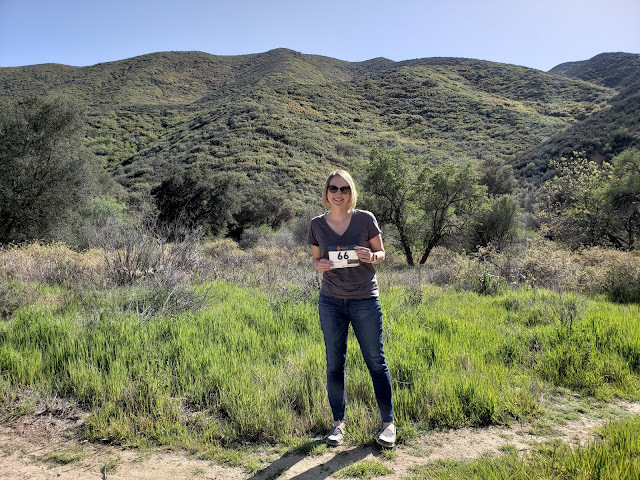 I was ridiculously happy to be racing trail again for the first time in over a year, and even when it was really hard I felt...incredibly HAPPY. Lucky to be out there running and climbing my little heart out. Fingers crossed my hip plays nice and I get to keep my 50K goal for this fall, unlike last year when I had to call it off. The last items to note are the fun swag and the free photos. I love that Brazen volunteers take photos and share them via Google Plus so you can download whatever you'd like. I've most likely used too many photos of myself in this post, but I'm so happy to have them I felt the need to use them! The shirts and medals had banana slugs on them, so what's not to like there? I have a feeling I'll be running this race again in the future! Swag! I really like the fit of the shirts too. The park looks gorgeous! I seriously lived almost on top of the fault for like 3 years & never got out there for running. Fail. 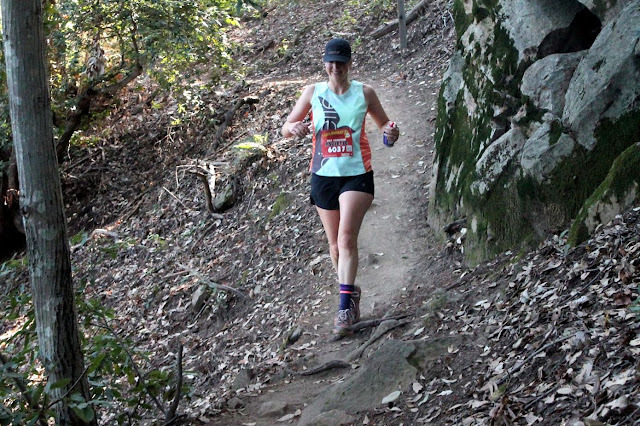 I really want to do some of their TRAIL-trail races (instead of the ones I usually run, which are more like "trail" races). Yes, it's so nice! I can't believe it's taken me so long to get out to it either. Great job out there on what looks like a really tough course! I haven't done this Brazen race yet, but now it's definitely on my list. Hope your hip stays healthy for your 50K goal! Thank you! Definitely try this course - they run it again in December as Summit Rock. :) I might do it again!